It was 9.29 pm on Jan. 31. Dozens of Yale-NUS College students packed themselves onto the balcony outside the Elm Rector’s Commons, their eyes fixed upon a fascinating sight: an abnormally large full moon, blood-red, hovering over SingTel’s four-armed Ayer Rajah Telephone Exchange tower. Dubbed the “Triple Moon” event, this phenomenon had not been observed by anyone on the island since 1866. This “Super Blue Blood Moon” phenomenon consisted of three separate lunar phenomena, all occurring simultaneously. A “supermoon” occurs when the moment at which the moon is closest to Earth—the moon’s orbit around Earth is slightly elliptic—coincides with a full or new moon, thus causing our celestial neighbour to appear larger than usual. A “blue moon” is a calendar coincidence: the second full moon to occur in a month. A “blood moon” is a total lunar eclipse where the moon moves into Earth’s shadow and receives no direct sunlight. The crimson color of the moon during a total lunar eclipse is caused by the refraction of light through the Earth’s atmosphere and a scientific phenomenon known as a Rayleigh scattering. Individually, each lunar phenomenon is not too rare. The next “blue moon”, “supermoon”, and total lunar eclipse will occur again individually this year: on March 31, Dec. 22, and July 27 respectively. Yet the stars truly need to align for all three phenomena to occur at exactly the same time —alas, such serendipity will not be had again for many years. The next “Super Blue Blood Moon” is predicted to appear in our night sky exactly 19 years later, on Jan. 31, 2037. In the meantime, students can at least enjoy the pictures they took during the event. Photo-taking was facilitated by the viewing organised by Ashen Light, the Yale-NUS Astronomy Club. Cheong Zi Gi ’21, a member of Ashen Light, surveyed the campus and selected the Elm Rector’s Commons as the best location for the viewing, which Elm Residential College Rector and Professor of the Sciences Brian McAdoo generously lent use of. 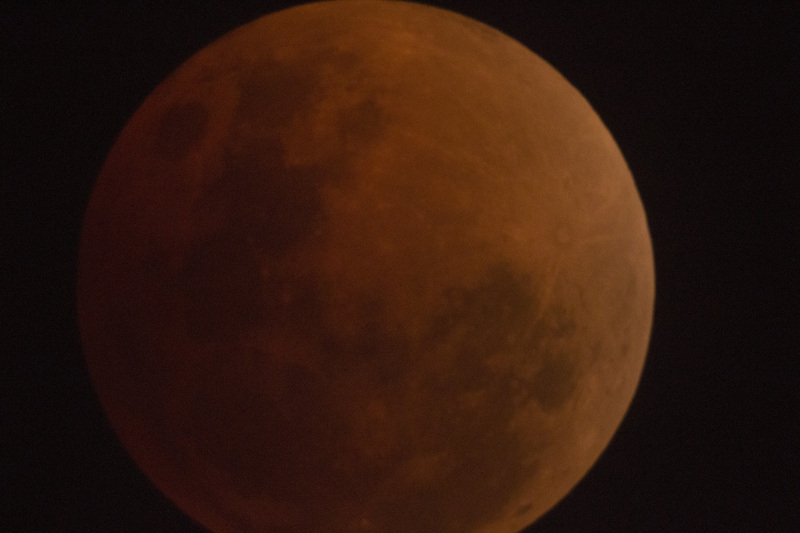 Two telescopes were set up, and snacks and drinks were provided at the viewing; some students positioned their phone cameras at the telescope viewer to take zoomed-in shots of the moon. On behalf of Ashen Light, Wu Shuin Jian ’18, the founder of the club, and Ricky T. George ’20, the club’s current president, took hundreds of telescopic pictures. These pictures captured the preceding partial eclipse, the total eclipse, and the receding partial eclipse thereafter. The pictures will be edited and focus stacked before being published on the Ashen Light Facebook page.